Dharmachakra in Sanskrit means the ‘Wheel of Dharma’. This mudra symbolizes one of the most important moments in the life of Buddha, the occasion when he preached to his companions the first sermon after his Enlightenment in the Deer Park at Sarnath. It thus denotes the setting into motion of the Wheel of the teaching of the Dharma. 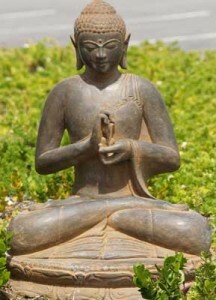 In this mudra the thumb and index finger of both hands touch at their tips to form a circle. This circle represents the Wheel of Dharma, or in metaphysical terms, the union of method and wisdom. The Little finger represents the Mahayana or ‘Great Vehicle’. The three extended fingers of the left hand symbolize the Three Jewels of Buddhism, namely, the Buddha, the Dharma, and the Sangha. Significantly, in this mudra, the hands are held in front of the heart, symbolizing that these teachings are straight from the Buddha’s heart. This mudra symbolizes charity, compassion and boon-granting. It is the mudra of the accomplishment of the wish to devote oneself to human salvation. It is nearly always made with the left hand, and can be made with the arm hanging naturally at the side of the body, the palm of the open hand facing forward, and the fingers extended. This mudra is rarely used alone, but usually in combination with another made with the right hand, often the Abhaya mudra (described below). 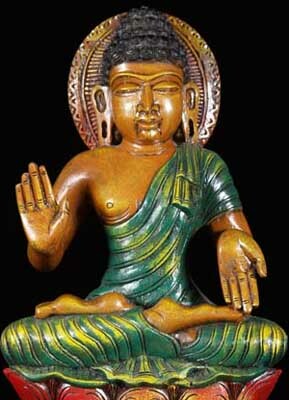 This combination of Abhaya and Varada mudras is called Segan Semui-in or Yogan Semui-in in Japan. The Buddha, whose original name was Siddhartha Gautama, was the founder of Buddhism, the religion and the philosophical system that produced a great culture throughout much of southern and eastern Asia. Buddha, meaning “awakened one” or “enlightened one” is a title not a name. 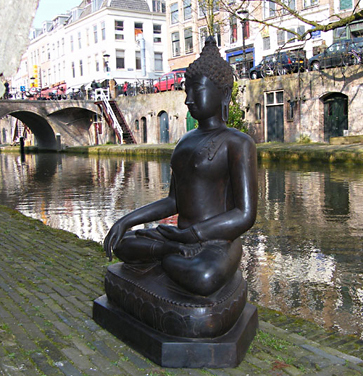 In Hindu Dogma, the Buddha is viewed as being the 9th avatar of the Hindu god Vishnu. 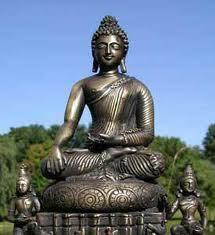 The Buddha was a son of the rulers Sakyas. He was married at the age of 16 and lived in luxury and comfort sheltered from the harsh realities of life. When he was 29 he realized that men are subject to old age, sickness and death. He became aware of the suffering inherent in existence. He resolved to give up princely life and become a wandering ascetic (samana) in search for the Truth. With the two of samanas he attained mystical states of elevated consciousness but he failed to find the Truth. He continued his search and was joined by five ascetics in a grove near Uruvela, where he practiced sever austerities and self-mortification for six years. When he fainted away in weakness, he abandoned ascetic practices to seek his own path to Enlightenment. Discarding the teachings of his contemporaries, through meditation he achieved Enlightenment, or ultimate understanding. There after the Buddha instructed his followers in the dharma (truth) and the “Middle Way” a path between worldly life and extremes of self-denial. The essence of the Buddha’s early preaching was said to be the four Noble truths: 1) life is fundamentally disappointment and suffering. 2) suffering is a result of one’s desires for pleasure, power, and continued existence; 3) to stop disappointment and suffering on must stop desiring; and 4) the way to stop desiring and thus suffering is the Noble eight fold path – right views, right intention, right speech, right action, right livelihood, right effort, right awareness and right concentration. The realization of the truth of anatman (no eternal self) was taught as essential for the indescribable state of release called nirvana. Buddhism is ubiquitous; it is a religious philosophy that has many followers worldwide. It is based on the ethics, enlightenment and compassion. The statues of Buddha represent the “enlightened one.” In today’s robotic life, when everyone is search of serenity and tranquility- Buddha statues comes as a great relief. 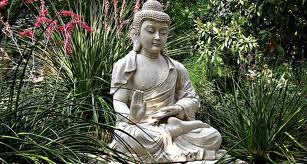 Buddha statues and sculptures can be seen all around us, in the living area, office space and garden area to bring in the serenity in the house. They are made form a variety of materials including granite, stone, brass and bronze. 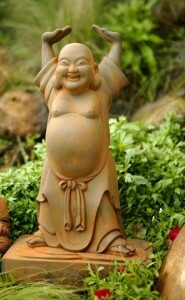 People custom orders garden statues to enhance the exterior décor of Zen gardens and meditation gardens. Buddha statues have always been thought of as bringing good luck, harmony and tranquility. In fact the concept has been marketed so well that it is a flourishing industry in its own right. The laughing Buddha statue, arguably the most popular one, is actually fashioned not after Siddhartha Gautama Buddha, the founder of Buddhism, but Budai, a monk from Chinese folklore, who was known as a happy, wise and contented man. The differences between the two characters are stark and unmistakable, somehow the identities were confused, and the monk is now content with usurping the original Buddha’s title. Your garden is a place of serenity and peace, and it may be where you go to wind down after a tough day at work or with the kids. It’s only natural to want to decorate it with symbols of that peace. For that reason, Buddha statues are perfect. They not only provide that ambient mood that you’re looking for, but who knows, they may actually bring the luck and harmony that they promise as well. Buddha statues are not worshiped by Buddhists but stand as a focal point for meditation, a symbol of truth, and the path toward enlightenment. 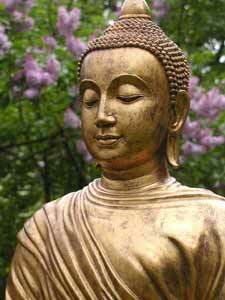 Born into a wealthy family in India around the 5th century BC, young Siddhartha was a cossetted prince. His doting parents, hoping to spare him life’s pain and suffering, sheltered him from anything unpleasant, anything that would cause him to wonder if life was not perfect in every way. He knew nothing of poverty, disease, death, or any of the common problems of everyday life. When, as a young man, he wandered off and observed the suffering of others first hand, he abandoned his privileged place to seek the life of an ascetic in search of truth. After years of wandering the county-side living a life of deprivation, Siddhartha decided to seek a middle way. He thought there could be a compromise between abject self denial and life in the normal world. After much meditation, Siddhartha became an enlightened one – Buddha. Laughing Buddha ( Happy Buddha)Known as Hotei (Japan) and Pu-Tai (China), these figures embody the ideals of the good life: health, happiness, prosperity and longevity.